First issue in an ongoing series! From his headquarters in the NFL Hall of Fame, Ish, the first NFL Guardian, is charged with protecting the NFL Powercores from a mysterious, otherworldly threat. Join Ish, his friends, a cast of NFL personalities, and the ever-loyal Rusherz as they battle a horde of Blitz Botz and their megalomaniacal overlord. 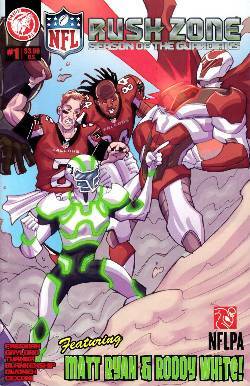 An officially licensed NFL book based on the hit Nicktoons series!